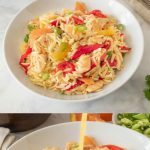 This Orange Chicken Orzo Salad is the perfect warm weather dish and will make a spectacular addition for picnics, beach days or road trips. This is an ideal dish that travels well that can be a meal in itself or simply served as a colorful, tasty side dish. 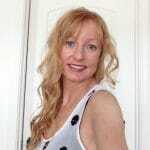 Summer is almost here and I’m going to share with you how I like to spend my summer holiday… at the beach! The best days of summer are when my husband and I pack a lunch and some drinks, grab our towels, beach umbrella and sunscreen and make a day of relaxing on the warm sand of the beach and taking in the warming Southern California sun. 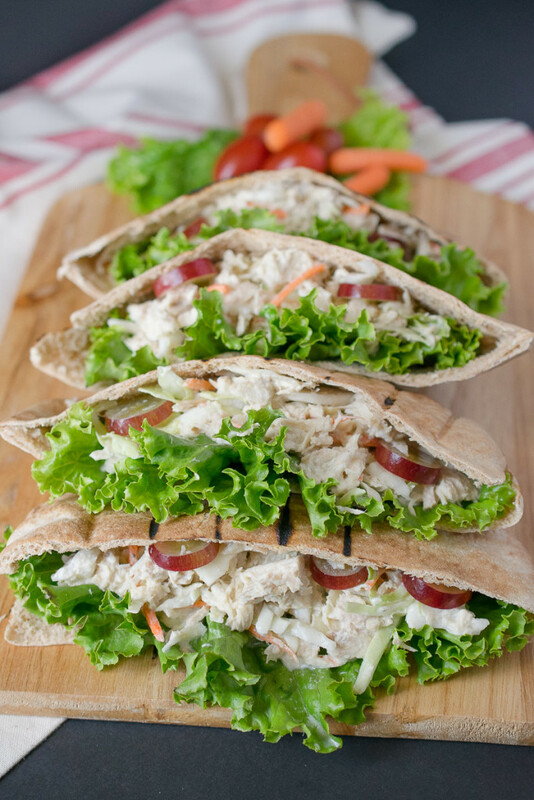 In addition to this orange chicken orzo salad, another favorite I like to take to the beach is a tuna pita pockets (< click for recipe link). I love the simplicity of this dish and it is so packed with fresh orange flavor, both in the dressing that is mixed with all the ingredients, as well as the chicken that is cooked in an orange sauce. There are jewels of fresh orange segments mixed throughout the salad for an extra burst of flavor, along with roasted red peppers and spring onions for a pop of flavor as well as vibrance and color. Once the orzo and chicken are cooked, all the ingredients are mixed together and the salad is done! 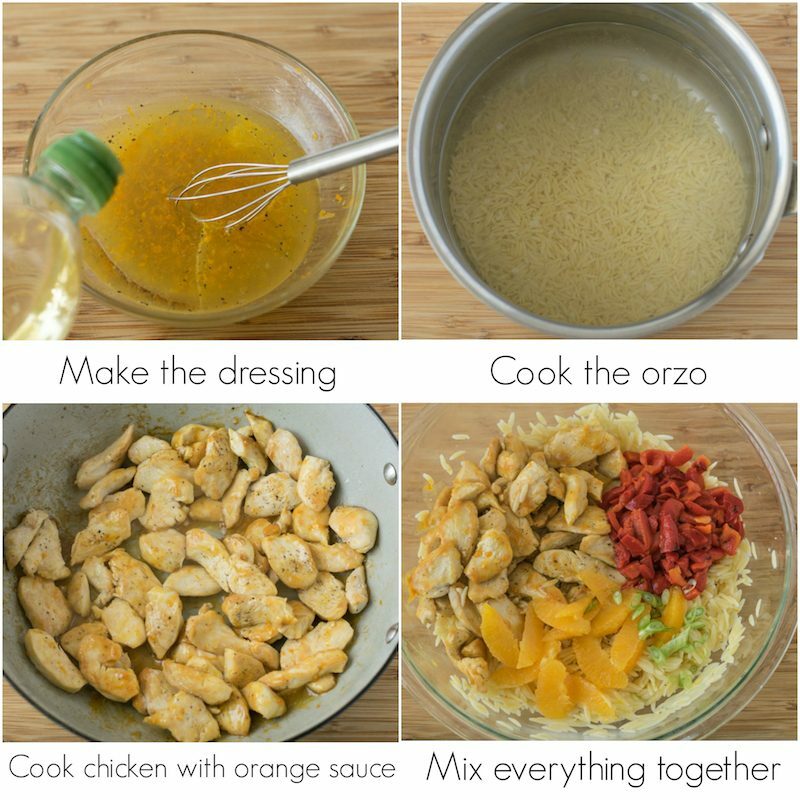 If you’ve tried this Orange Chicken Orzo Salad or any other recipe on the blog, then don’t forget to rate the recipe and let me know it turned out in the comments below. I love to hear from my readers! 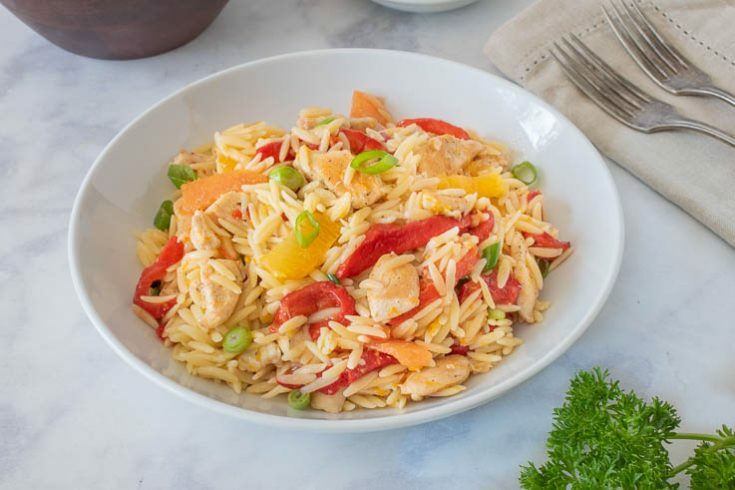 Chicken is cooked in an orange sauce and served over delicious orzo with red peppers and fresh orange segments. Add the orange juice, zest, honey, white wine vinegar, salt and pepper to a bowl. Pour in the oil while whisking until emulsified. Set aside. Add 4-6 quarts of water to a large saucepan and bring to a boil. Add 1 tablespoon salt to the water and add the orzo. Simmer for 9 minutes uncovered and drain. Add the orzo to a large bowl and pour over half of the dressing, mix and set aside. To a heavy skillet add the oil over medium-high heat. When the oil ripples, add the chicken and brown. Mix the zest and juice of 1 orange with the corn starch until dissolved. Add to the pan of chicken and mix well. Cook until thickened and remove from heat. Add the chicken to the orzo to a large bowl along with the orange segments, red peppers and green onions and the rest of the dressing, mix well. Serve warm, room temperature or chilled. This is great! So fresh with great summer flavors! And orzo pasta is so yummy! Love orzo pasta. This looks so delicious! Great flavors, perfect for this time of the year! Anything with orzo sounds super delicious to me. If you top it with orange chicken you can really have a winner on your hands. Pair it with Aquafina is a splendid idea. This sounds like the most refreshing meal EVER! I’m a huge fan of grapefruit drinks, so I’m heading to Target to find Aquafina, and of course I’ll be making your gorgeous salad, too. I’m planning a trip to the beach this Memorial day weekend – this would be perfect for the packed lunch! Thank you! I love finding new salad recipe ideas, because in the summer we eat a lot of salads. I brought this to the beach this past weekend and it was so good, the kids inhaled it. The orange segments really make it.